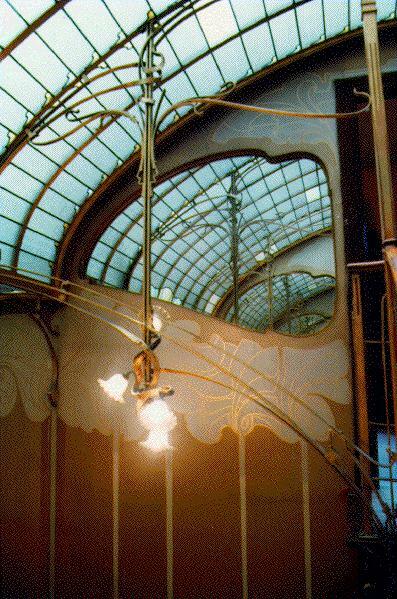 Victor Horta is the most well-known Art Nouveau architect. His building "House Tassel" is considered as the first Art Nouveau building. It was built as early as 1893. His introduced vegetal curve dynamic in his building designs and asymetry. His plans are always very clever and rational. He always uses new materials like iron, large light well in glass or stain glass, and new technics like central heating or electrical lightenings together with traditional materials like stone. As an architect, he also designed every part of the house, from the carpet to the fire-dogs. In his memories, he said "I was not the first architect of my time to design furniture but I was the first to integrate it to my architecture". As for me, I appreciate the vegetal curves shapes the transforms the massive stones. After the first world war, he continued his work with more geometrical shapes, but also with more public orders (Museum, Station, Pavillion for International exhibitions...). At this time, he also used more standard elements to reduce the costs of his buidings influenced by his knowledge of Sullivan's and Frank Lloyd Wright's works that he learned deeper during his exil to the United States from 1915 to 1919. His social ideals found their expressions through his involvement in architecture and arts education (from 1892) and in the realization of the "Palais du Peuple" ("People Palace") .